Mike Roberts shows off the entirety of his compact Resurrection Records shop. Mike Roberts had only lived in Spokane a few days before noticing the for-sale sign posted on the Northwest Boulevard property, but he saw the potential in this tiny storefront. Here, he could sell records and tapes. He could have a home for his Resurrection Records label. After making a call to the property owner, he moved into the shop at the end of September. He had been in town for less than a month. "I like talking to people about music all day," says Roberts last week at his Resurrection Records store. "I may not know as much as others, but I always like to learn through conversation." 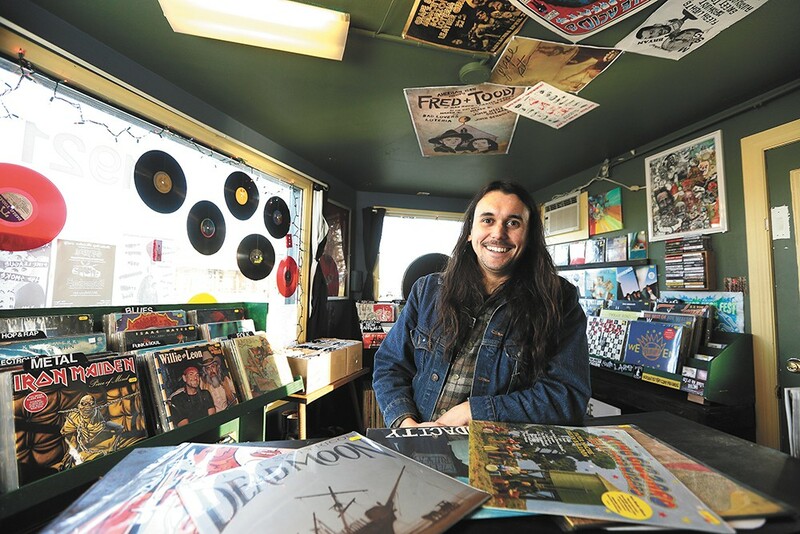 The shop, oddly shaped and mostly windows, is just 150 square feet, yet Roberts is able to stuff tons of new and used records and tapes, along with posters and music memorabilia, inside. No matter how small the shop is, his space heater has trouble keeping up. Sometimes, when he's playing an album in-store, the record player slows down to a crawl, like it's cold, too. Roberts is aware of the other record stores in the Inland Northwest area (two newer Spokane spots, Garageland and Groove Merchants, are still going strong, as are older, more established shops), and he knows about the demise of Hastings, a retail chain that sold new and used music and more. While the store wasn't just regional, with 126 outlets nationally, music fans felt the pain from the handful of local Hastings closings — the Spokane Valley location even hosted a farewell concert in November. In a world where online retailers continue to dominate vinyl sales, the future of brick-and-mortar music stores is unknown, but Roberts says he thinks there's room for all the record shops in Spokane, especially when each has its niche. Only 26, Roberts says he carries a newer selection of records than other stores in town, and that he's open to carrying everything. "I was told that country wouldn't sell here," he says. "But I set up a section in my shop and people buy those records all the time." Roberts also says he never wants to judge someone based on the choice of records they buy. He remembers purchasing his first records in the L.A. area, where he grew up, from store clerks who smirked at his selections. This isn't his first foray into the music store business; he was part-owner of a record shop in Santa Ana, California, in 2012. Then he moved to Portland and expanded his record label business, releasing albums for bands all over North America. He endured the heat of Austin, Texas, for the first part of 2016 before deciding to join his mother in Spokane. "There isn't that elitist attitude here, as there is in places like Austin and Portland," he says. "People are welcoming here and they get along in the music scene, instead of constantly competing." Vinyl collecting is also continuing to lose its elitist, music-snob stereotype. According to Nielsen's 2016 U.S. Music Mid-Year Report, vinyl now takes up about 12 percent of the physical business of all music sales — although overall music sales continue to decrease as streaming service revenues skyrocket. Roberts' life changed at age 15. That was the year he started spending entire paychecks on records and going to shows, when he could get there. Now he sees curious teenage customers coming into his shop almost daily. 'Tis the season for holiday tunes, and Inlander music writers went in search of the best Christmas vinyl that local record stores have to offer. Here are some of our off-the-wall favorites. Now go find your own. Pac-Man Christmas Album, Various artists. Who knew that dot-gobbling yellow orbs had voices? "Last Christmas" 30th anniversary 12-inch red/green-colored vinyl, WHAM! Primo '80s cheese and a modern Christmas classic. Christmas at Liberace's, Liberace. The piano man who makes Elton John look conservative tackles holiday oldies. The Sinatra Family Wish You a Merry Christmas, Frank Sinatra and Family. Old Blue Eyes out front, white turtlenecks on the cover — the Sinatra Family Christmas album is an offer you can't refuse. Christmas Rap, Various artists. Featuring Run D.M.C., Dana Dane and more, you'll learn what it's like to spend "Christmas in Hollis." Tijuana Christmas, The Border Brass. Classics like "Jingle Bells" get the mariachi band treatment, and it's time to party. Phil Spector's Christmas Album, Various artists. Long before Phil was convicted of murder, he released this gem — featuring Darlene Love's "Christmas (Baby Please Come Home)." Strawberry Shortcake Christmas Album, Various artists. Oh, what joy tunes like "Strawberryland" can bring you.